What’s this “Gate” Stuff All About? A gate is a notch or an opening between two hills, or the entrance to a canyon. Here is Middlegate viewed from the east; Middlegate Station is two miles west of here. There are three gates – Middlegate, Eastgate, and Westgate. Just like Frenchman Station, I have no clear idea why I am so attracted to Middlegate Station. It might be that on a hot day you can get a nice, cold beer. The hamburgers are known for miles around as the best, a reputation deserved. It is said that the pilots from Fallon Naval Air Station (the Top Gun facility) will drive all the way there for an evening of food and drink. The folks behind and in front of the bar are delightfully quirky, and talkative. I met many “characters” when I was there. I suppose I should define “character” but I won’t. Nonetheless I had a great time talking to folks and enjoying the surrounding conversation. 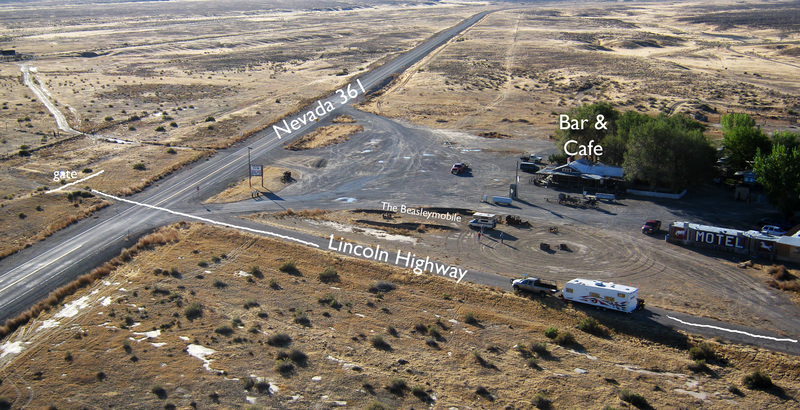 The station buildings are adjacent to the Lincoln Highway and the station has been there since it was a stop on the Overland Stage route. A motel was added in later years. 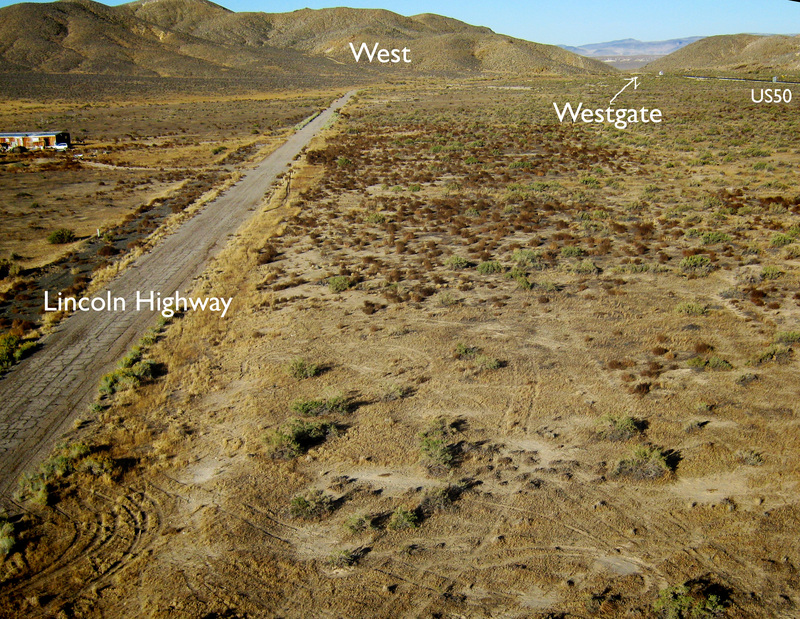 The new Highway 50 was built parallel to and just a bit north of the Lincoln. You can drive the section of the LHW west from the station shown in the photo below, but on the east side the road is blocked. There is an inexpensive motel at the station but you can camp at no cost just north of the station as these folks are doing. In fact they camped there for nearly a week and took their quads and sand rails out for recreation nearby. 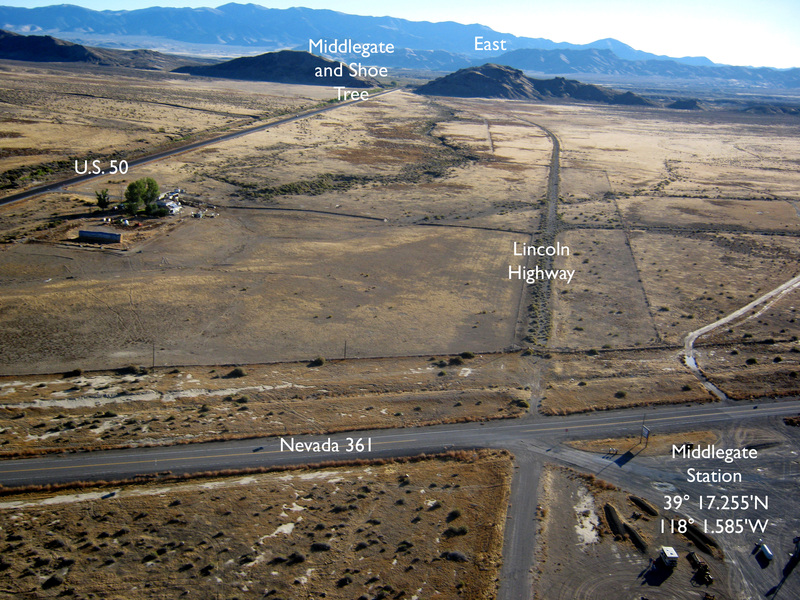 The view above looks roughly south towards Gabbs on Nevada 361, another interesting diversion from the main highway. Middlegate Station serves breakfast starting around seven and closes sometime around two in the morning. There is even wireless internet available. There is one gas pump. Looking east you can see Middlegate itself and the Lincoln Highway (not drivable now) curving to the gap in the hills. The shoe tree was a famous stop on U.S. 50 but sadly was recently cut down by a local fellow in an argument about a girl. That sounds perfect for a soap opera episode to me, and it’s true. A new tree has been designated and that is rapidly filing up with shoes. Read the story of the Show Tree by clicking here: odditycentral.com. 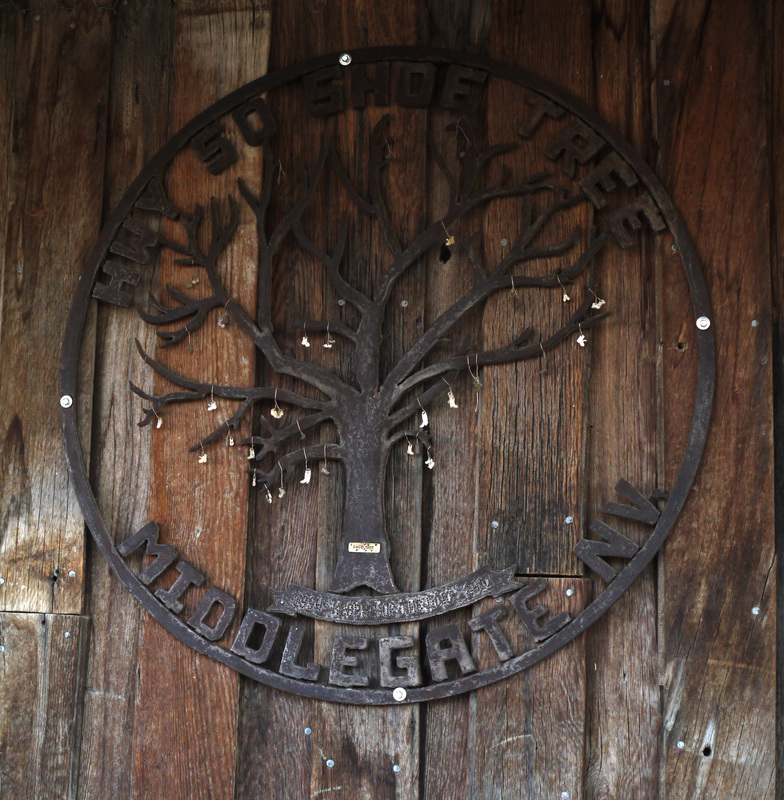 The folks at Middlegate Station have erected the wonderful plaque and also sell raffle tickets for a clipping of the old tree, so that you could raise your own show tree. You may also purchase clippings at the Churchill County Museum in Fallon. Finally I headed east toward Austin on Hwy. 50 for a few miles then took a bypass to see Eastgate, which was on the old highway. This junction for State Hwy. 2 (also known as 722) is here ( 39° 17.821’N 117° 58.135’W) and is not that well marked. 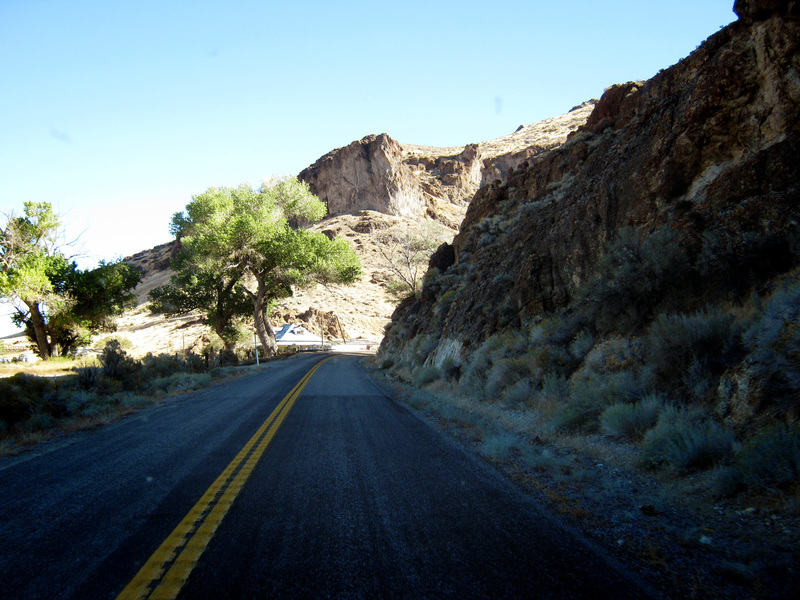 Eastgate is a point of diversion for a nice paved road up a canyon and the highway leads to Austin. The old Lincoln Highway came down to Eastgate from the north and Cold Springs Station. From the junction to Eastgate you will be a little south of the old road which is off in brush to the northeast. State Hwy. 2 is actually a later paved iteration of the Lincoln Highway and so it is a legitimate road to travel in the current context of this blog. At the Austin end of 722 the turnoff is here: (39° 30.025’N 117° 7.424’W). 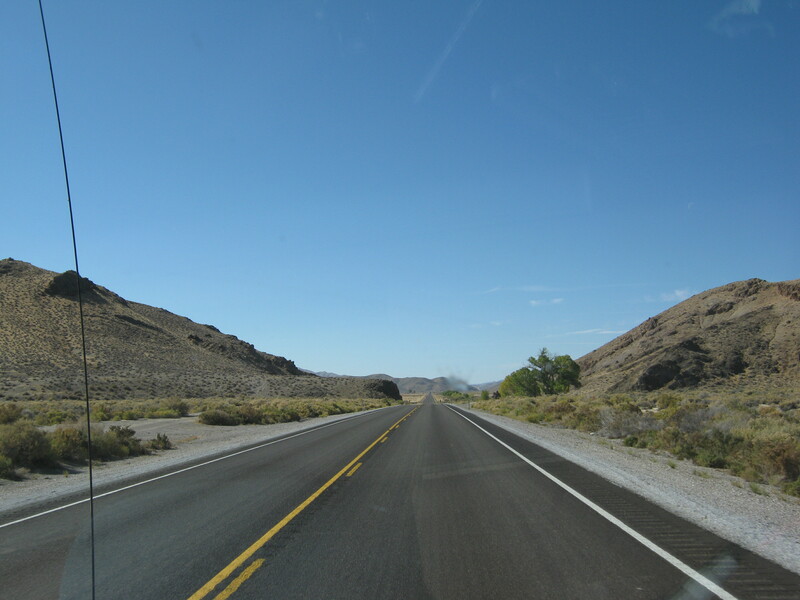 To or from Austin, Nevada, take Highway 2 (722) in at least one direction. There is only one mile difference from the Hwy. 50 route and frankly it is much more interesting. If you are determined to see Cold Springs Station then the Hwy. 50 route is a better choice but less scenic. 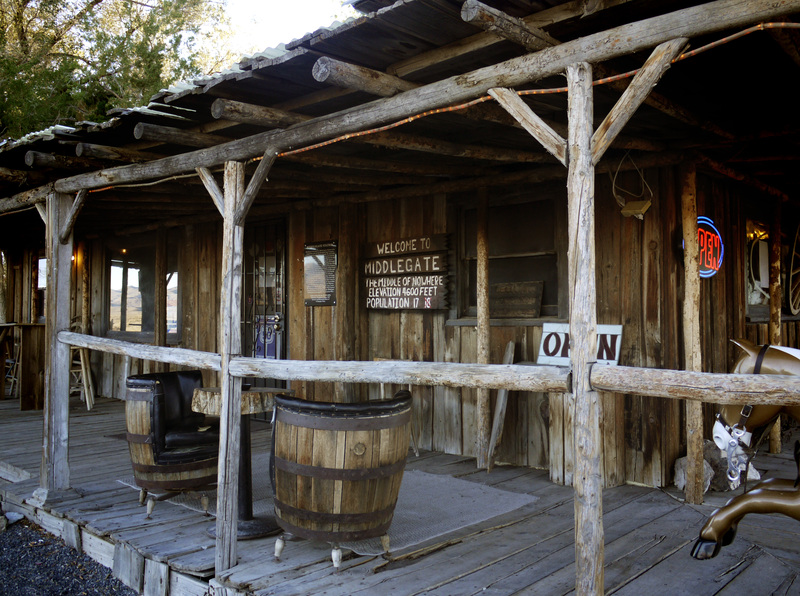 Also, do stop for a burger or beer at Middlegate Station. People have asked about how I managed to get the aerial photos. I carry with me a remote control airplane and/or helicopter with a Canon A480 camera mounted on it. Using a piece of software called CHDK I set the camera to take a photo every few seconds and then pick the “keepers” from the hundreds of shots obtained. Wonderful stuff. These recent posts provide some very practical guidance plus they’re nice to look at and enjoyable to read. I’ve only stopped at Middlegate once and didn’t even realize that the real Lincoln Highway bordered the parking lot. Guess my mind was on beer and a ‘burger. The aerial photos are extremely impressive and so is the explanation of how they are obtained. This blog has quickly become one of my favorites. This is turning out to be an enjoyable project. Thank you so much for sharing. The pictures are really great!